Pakistan Star takes his second G1 win of the season in the Standard Chartered Champions & Chater Cup at Sha Tin today. The renaissance of the Tony Cruz-trained Pakistan Star continued in style at Sha Tin today (Sunday, 27 May) as arguably the most popular horse in this part of the world – certainly the most discussed – capped his topsy-turvy season with a comfortable win in the G1 Standard Chartered Champions & Chater Cup (2400m). Gone, for now, are the days of the roguish Pakistan Star; the 2016 Hong Kong International Sale graduate gave his supporters arguably their easiest watch yet. Settling second, never more than three lengths off Exultant’s even tempo, jockey Tommy Berry tracked up ominously on the bend as his four rivals resorted to a vigorous drive. Indeed, upon straightening, the result never really appeared in doubt. Sweeping to the lead at the 300m, Pakistan Star looked the winner a long way from home, and while the dazzling turn-of-foot that he had displayed in his last-start win in the G1 Audemars Piguet QEII Cup (2000m) wasn’t there, in its place was a clear class edge over his rivals that saw him assert his superiority. At the line, Pakistan Star held a margin of one and three-quarter lengths over Exultant, with Gold Mount flying from last, as is his want, to finish third, four and a half lengths from the winner. For Cruz, it was just as he had hoped and predicted – a one-two-three for his stable. 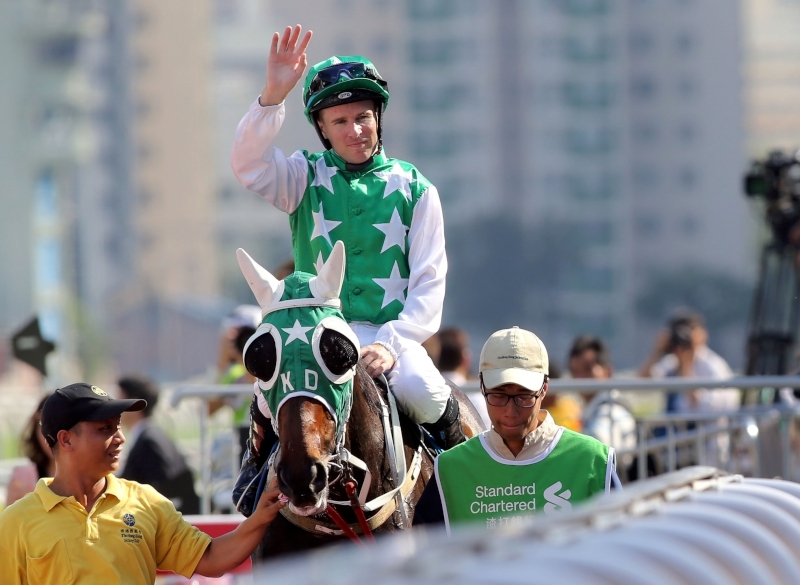 Berry was taking his first raceday ride on Pakistan Star, having been aboard in two barrier trials, and the Australian jockey said that he was confident throughout the HK$10 million feature. Tommy Berry salutes the crowd after the victory. “There were no worries today,” Berry said. “I was pretty happy 20 metres after the barriers because he’s been known, especially in his trials, to jump out and want to get a little bit keen with some good early speed. Full credit to Tony, giving him that trial the other day in between races took that edge off him and so quickly after the start, he dropped the bridle for me and I was able to bring him back and settle him behind Exultant. He switched off well the whole way. For Berry, it was the breakthrough he had so eagerly sought after a difficult season. Before today, the 27-year-old had ridden 13 winners from 74 meetings, with his position as stable rider to the John Moore yard – which he began at the start of the term – coming to an end in March. After a treble at Sha Tin today, though, he is hoping that his luck may have turned at last. “Interesting is one way to put it,” he said. “It’s been a very frustrating season for me and, I must admit, I’m not used to having a quiet patch. I’ve been blessed in my 10 years of riding to have a pretty smooth run, whether I’ve travelled internationally or stayed at home. I have to thank John, it’s because of him that I’m getting opportunities like this, he got me here and I won a lot of Group 1s for him along the way. “I also have to thank Tony and the connections. I know myself, if I’d told the connections that I was going to put on a jockey that had ridden 13 winners and that was out of form, I’d be second-guessing what Tony was doing, but they have stuck solid since I rode him in the trial before the QEII. There were nights I’d be laying in bed, waiting for the call to tell me that I wasn’t on him because my form hadn’t been good enough. 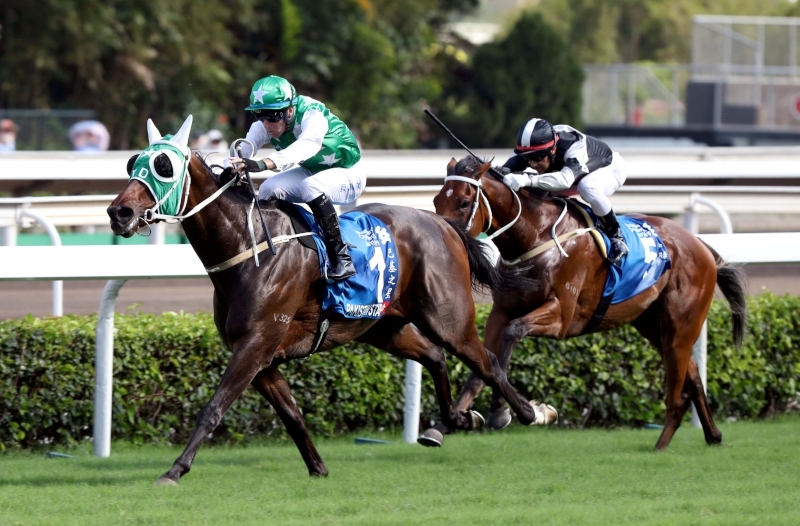 Pakistan Star lands the G1 Standard Chartered Champions & Chater Cup in style. Cruz confirmed that Pakistan Star’s season was now complete, with no plans to run the five-year-old in the G3 Premier Plate Handicap (1800m) on 24 June – the race in which he infamously stopped last year. And while Pakistan Star’s roller-coaster career has attracted many international fans, Cruz said that – at least for the time being – they will need to book a ticket to Hong Kong to be able to see the bay in action, with the main target December’s G1 LONGINES Hong Kong Cup (2000m). “It’s going to be an all-domestic programme I think,” Cruz said. “We’ll stay in Hong Kong and the main goal is to win at the international meeting in December. The fact he sees out 2400m means that we could consider the Vase, but the Cup is the biggest race in Hong Kong and he might be the best horse here. I think the 2000m suits him better, too. Pakistan Star’s win, in a time of 2m 27.42s, also puts him right in the vanguard for Horse of the Year honours, alongside stablemate Time Warp and the Moore-trained Beauty Generation. Jockeys Brett Prebble and Alberto Sanna, who rode runner-up Exultant and third-placed Gold Mount respectively, expressed their awe for Pakistan Star. The Moore-trained Eagle Way, who raced up with Pakistan Star on the turn, faded to finish fourth under Joao Moreira, while the race’s first ever international contender, Ralph Beckett’s Chemical Charge, was never a factor, finishing last of the five. Oisin Murphy was in the plate. Racing continues at Sha Tin on Wednesday night (30 May), with eight races scheduled for the all-weather track.